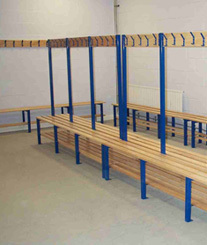 Changing Room and Cloakroom furniture, manufactured to any length and individual requirements. Abacus Design and Fabrication Ltd. offer a wide range of versatile changing room and cloakroom fittings and equipment. Manufactured from quality hardwood slats with pencil rounded edges, sealed and spray polished. We also provide quality hanging rails and peg rails. In addition, our new range of storage & shelving solutions are manufactured to the same exacting standards. If you want to know more about Abacus products or would like to discuss how we can help please get in touch, we'd love to hear from you.